Tom Udall is a U.S. Senator for New Mexico. 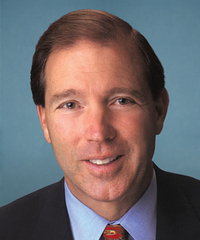 Udall was first elected in 2008. He opposed the Trump administration’s attempt to roll back national monument designations, and said making cuts to the Land and Water Conservation Fund would be crippling to New Mexico’s economy. Udall was also a signatory to a letter expressing concern over oil and gas drilling near sage grouse habitat and said rescinding methane emission regulations was a waste of taxpayer money. U.S. Senator Tom Udall He Would Fight Trump “Every Step of the Way” on Rescinding National Monument Designation. U.S. Senator Tom Udall Said Land and Water Conservation Fund (LCWF) Cuts Would Cripple New Mexico’s Economy. U.S. Senator Tom Udall Signed a Letter that Expressed Concern Over Oil and Gas Drilling Near Sage Grouse Habitat. U.S. Senator Tom Udall Said Methane Emission Regulations Were Needed.